I’ll be breaking down the tracks one-by-one with my opinions on it. Please note I may be a bit harsh on some of the tracks; I don’t actually hate any of them, I just thought some were a bit stale and some were just not as good as the others. One of the retro tracks remade for Mario Kart 8, Yoshi Circuit is a fun track, but will cause problems for any racer whose vehicle has bad turning. Part of the track has a zig-zag that rivals, and possibly tops Rainbow Road in levels of frustration of falling off the track. Luckily there is no ledge on this part, you’ll just end up in grass. Plus, the track is in the shape of a Yoshi! 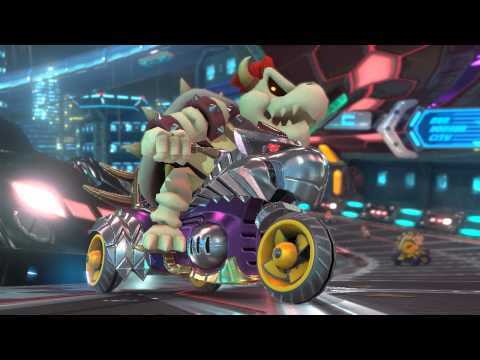 This has to be one of the most popular tracks in the Mario Kart 8 DLC, as it gets picked a lot when I race online. Why this track is picked constantly is clear; big jumps and big air are all around this course, which makes it a great track alone. 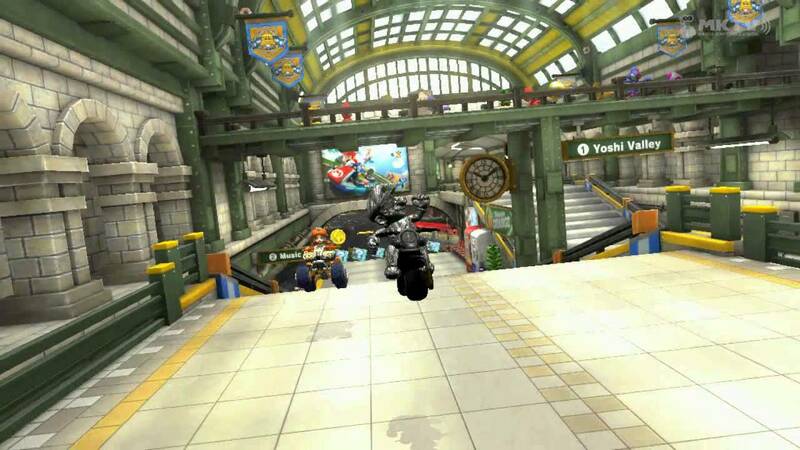 It also has a nice remix of the original Excitebike theme. If you’re a fan of big jumps then you will love this track. There’s something funny about Mute City for me, I always do terrible on this track but I still love it from the constant speed boosters to the unique style of earning coins from driving over certain parts of the track, Mute City is a great course. If you’re an F-zero fan this track may be enough to convince you to buy the DLC. I absolutely hated this course in Mario Kart Wii; the mine carts would constantly run into me and I lost many races because of it. However in the Mario Kart 8 remaster of Wario’s Gold Mine is much better, considering if you hit a cart you’ll just get a speed boost. I’m still not a big fan of the course, it’s not entirely exciting, but at least it’s not broken like the Wii version. It’s been my opinion that Super Mario Kart’s Rainbow Road was the weakest of them all, but in this remaster Nintendo improved the track to where it’s more fun. Almost all the additions were just a few Thwomps, but that makes all the difference. So instead of long, boring straightaways you’ll have to avoid obstacles, which freshen up the course. Rainbow Road SNES can also be a very hard track unless you’ve got turning and drifting down really well, but the same goes with the other two Rainbow Road courses in Mario kart 8 as well. Once again, the obligatory mediocre track in this cup, Ice Ice Outpost is pretty bland; the only cool thing about this track is that a majority of the track can be experienced in two routes, just like sweet sweet canyon (which I didn’t like much either) Although it may just be the pale colors of the track that makes me dislike it. Ah, the awesome course that every Zelda fan will love. The race starts immediately with a new version of the main theme of the Zelda series. Not only that but the coins are now rupees, and you can race though the temple of time and see the master sword in person, and fly through it off of a ramp! Even if you’re not a huge Zelda fan this is a fun track with great music. Now why does it seem like I dislike every third track in each cup? Yes, you guessed it; I’m not a big fan of Wild Woods. It really feels like a Donkey Kong Country level, which isn’t bad but I’ve never been a fan of jungle levels in Mario Kart. However if you like jungle levels, you will probably like Wild Woods. Ok, this is when fanboy bias comes into play. I’ve always been a huge Animal Crossing fan, and this track is a love letter to the franchise. There are four different versions of the track, one for each season. Each season a different variation of the same music will play, and the course will alter based on the seasons. You get a little of everything in Animal Crossing in this track, the beach, the fruit trees, and the houses are all viewable in this track. This track keeps me hopeful that we will see an Animal Crossing Wii U at E3 this year. This was always a fun track in Mario Kart: Super Circuit; I loved the color and playful scenery included in Ribbon Road, and the revival of it in Mario Kart 8 delivers. 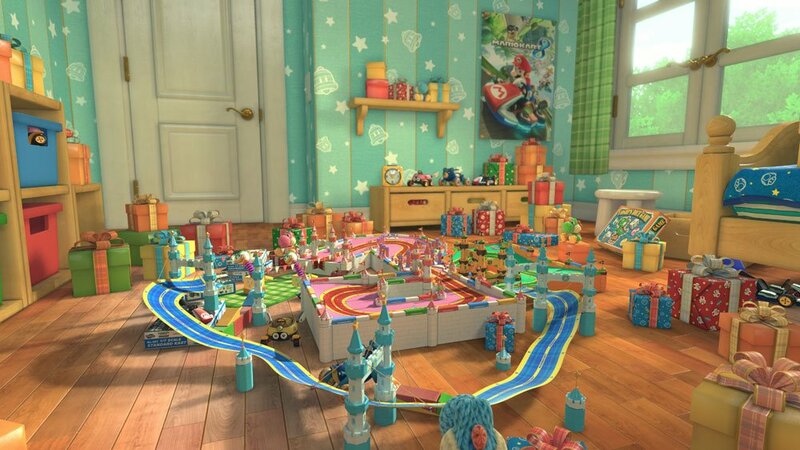 The colorful scenery and endless amounts of giant toy objects make this a very pretty track to look at while racing. I think the scenery sells this track more than anything else, and I’ve heard there are Easter eggs all over the track’s background, so see if you can find them. Guess what? I don’t like this third track in a Mario Kart 8 DLC cup either! There are two things that really bug me about Super Bell Subway; first, the driving area is a little too wide. In fact, the only problem you should have is avoiding the subway. Oh, and that’s my other point. The subway will ruin your race; I refer to how I hated Wario’s Gold Mine because I kept getting hit by mine carts. I understand that the wide areas are for avoiding the subway, but if you’re on the wrong side of the track when a subway approaches you’re left with a very narrow spot to ride on, and unless you’re skilled at turning, you will get hit by the subway train. It’s just a frustrating track. 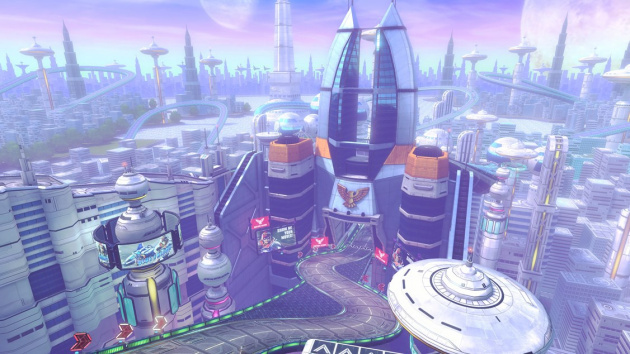 Yet another F-Zero track, could Nintendo be hinting at something? Big Blue, like Mute City, doesn’t disappoint. This is one of those three-section tracks, and it’s a ton of fun. A lot of the Anti-gravity is used in Big Blue, and it’s used well. The music is wonderful, a modern version of F-Zero’s Big Blue track. Once again, if you’re an F-Zero fan you can’t miss this track. It’s the closest you’ll get to an F-zero game at this time. Now with all of that covered, you might have a good idea of what the tracks are like. As for the characters, if you want to race as Link, Cat Peach, or Tanooki Mario, those are in pack one. If you want to race as either Villager (male or female) Isabelle, or Dry Bowser, those are in pack two. As I said the vehicle customizations are not a big deal and there’s not much to say on them, so I won’t cover them. Also, I can’t stress enough the disclaimer at the beginning; this is a very critical review of the tracks. The ones that are just ok or higher rank are very fun to me, while the ones below that rank I more just feel indifferent about. Why? Because I couldn’t write a review just saying everything was awesome, because some really were better than others and I needed to clarify that somehow instead of giving every track a “good” or “awesome” so I divided them into classes based on how good the tracks are compared to others. Overall I can’t recommend the Mario Kart DLC enough. You’re getting a bunch of new content for a great price. 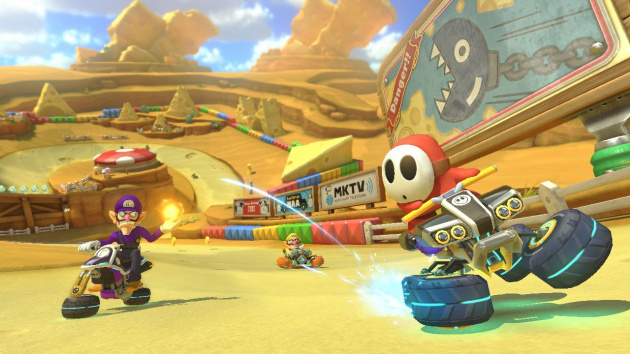 It’s a nice way to keep Mario Kart fresh and to keep the online community active. This article has blown me away! Fantastic work @Gamergy! @Gamergy There's also the fact that I like exotic music styles. I can tell that you put your heart and soul into writing this beautiful feature. Excitebike Arena and Hyrule Circuit are the awesomest! Hyrule Circuit was all that was needed, the rest were a bonus! I have enjoyed all of the courses in the dlc packs, well except Rainbow Road SNES. You should write more reviews for #dlc!